Many people watched the first program in the seventh season of Game of Thrones Sunday night. This was the beginning of the second-to-last season for the award-winning television series. The series is the creation of American cable and satellite television network HBO, or Home Box Office. Game of Thrones is available mainly in the United States and other English-speaking countries, such as Australia and Britain. 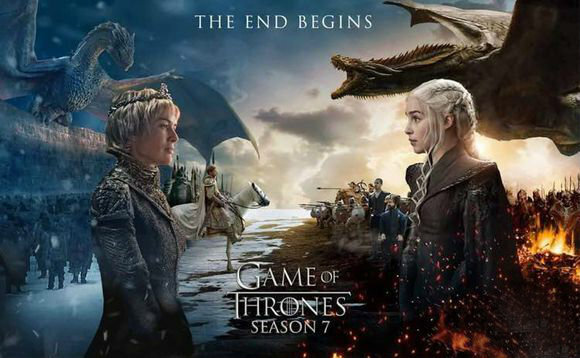 About 8 million people watched the last episode of season six, which came out last June. Add in people who watched the show on a computer or electronic device, and the total was over 20 million. With that many people watching, it is no surprise that "Game of Thrones" was a hot subject Monday morning. In the U.S. alone, over 5 million people searched Google for keywords related to the show. Game of Thrones was also the top entertainment subject on Facebook. Game of Thrones is based on a series of books by George R.R. Martin. The book series is known as A Song of Ice and Fire. The first book, called "A Game of Thrones," came out in 1996. The first episode of the television show came out in 2011. To date, 61 episodes have been released. The show's actors have become famous and appeared in movies. Some of the best-known actors are Peter Dinklage, Lena Headey, Kit Harington and Emilia Clarke. So what did people think of Sunday night's episode? Entertainment Weekly called it "terrific." The magazine wrote that almost every important character made an appearance and "set the stage for ... an epic end game in Westeros." Westeros is the make-believe continent within which much of the action takes place. Many people reacted to the appearance of a fairly new character, Euron Greyjoy. He is the new king of the Iron Islands. He wants to make an alliance with Cersei Lannister, played by Headey. Greyjoy is played by Danish actor Pilou Asbaek. Lots of people reacted on social media to his leather clothing. They said he looked like a rock music star or someone about to go out dancing. Fans of the TV series enjoyed connecting with their favorite characters after more than a year. In addition, many fans reacted to the appearance by British singer Ed Sheeran. He was singing at a campfire. Most people thought it was funny to see the singer on the show. The online magazine Slate publishes a report on each week's "Game of Thrones" episode. It is called "This Week's Worst Person in Westeros." This week, the magazine nominated Sheeran for the honor. He once told an interviewer that he didn't even like rock music. She made an appearance after they left. 1.Westeros is the make-believe continent within which much of the action takes place. 2.The magazine wrote that almost every important character made an appearance and "set the stage for ... an epic end game in Westeros." These investments will set the stage for a pattern of low-carbon growth. Her uncle tom's Cabin inspired a generation of abolitionists and set the stage for civil war.